Despite suffering insect bites, scratched legs, and a general lack of washing, this was an expedition which brought together ten women who shared their concerns - Jo had recently lost a baby, Charlene's mother had died of lung cancer, one was anxious about getting pregnant, another was a full-time carer and one woman had recently been diagnosed with Parkinson's disease. 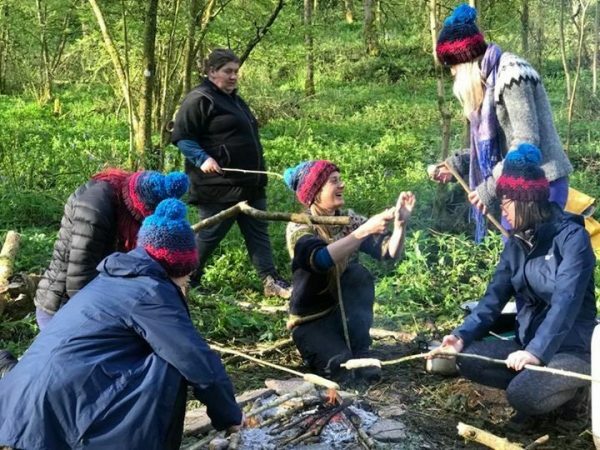 Despite personal issues, or perhaps because of them, the whole experience of this survival challenge and sleeping under the stars left the group "mentally and emotionally on a real high". 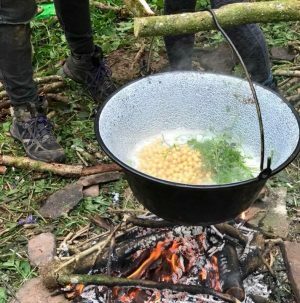 "We only ate 541 calories a day, so it was no wonder..." explains one of the group of ten, a 67-year old who had never been camping before, "our conversations became increasingly about food." Mastering fire and water is essential to survival and can’t be taken for granted. 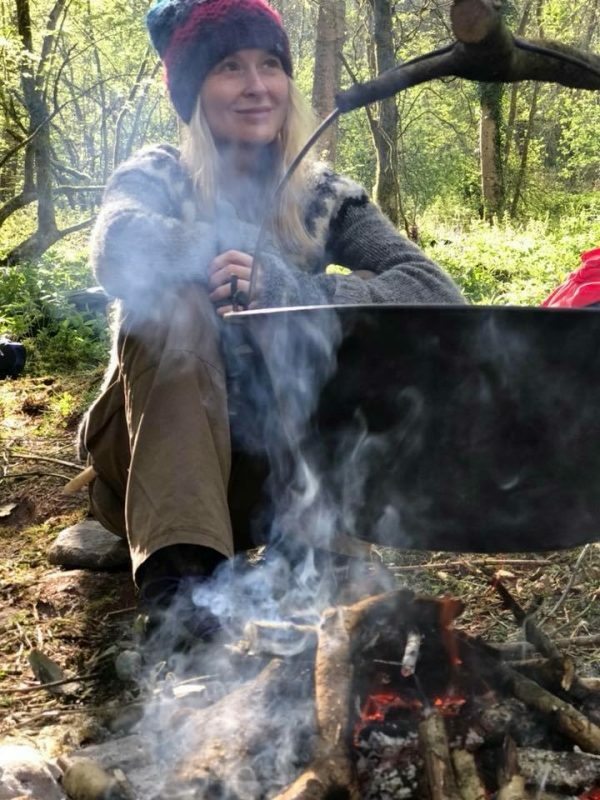 "Lighting the fire using only flint and steel on the first day took us two hours but once we got it going we loved the heat - despite the sunny days, the mornings in late April were remarkably chilly." The women found that one member of the group, Katie, was much more effective than the others in getting the fire lit. Each quickly became adept at finding the best kindling. Long discussions were had on whether it was worth trying to keep the fire lit through the night - in the end, it would be best to relight it each morning. To get drinking water the group needed to boil water from the stream 200 metres away from their main camp. Although the plastic jerry can was large, they could only half-fill it because of the weight. The water run (or slow walk) was a shared task. "We discussed the importance of charities like Wateraid, knowing that around the world in many rural communities water has to be carried much further; usually by women and children." Another facet of water and survival is the loo. Every campsite needs a toilet - and the group found that digging hole in woodland is not so easy and for some, squatting can be hard on the legs. Throughout the adventure various specialisms developed. Initially the group considered whether to appoint a leader or perhaps select a new leader for each day, but in the end they opted for collective leadership. Every task got done. Nobody felt that others weren't pulling their weight. 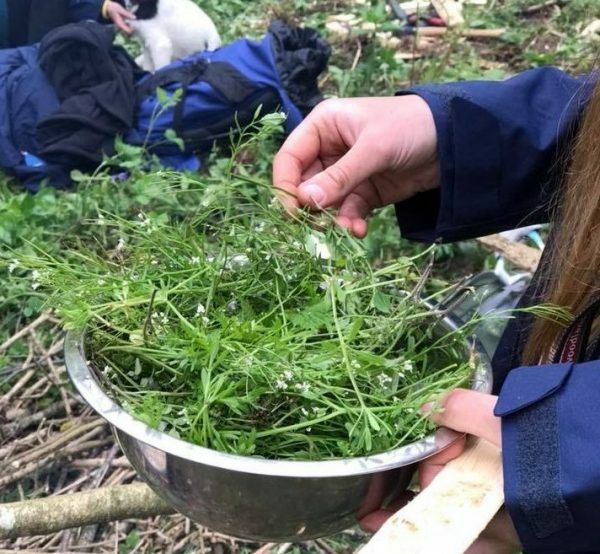 Between them, the group had quite a lot of knowledge of foraging and they found a patch of wild garlic which enabled them to flavour their rice rations. They identified green leaves to provide extra vitamins. Lady's smock has a peppery/mustardy flavour but after several meals of rice, it’s hard work to liven it up with anything. On the first day they were grateful just to be eating but by day 5 they couldn't finish their meals. "We gave the left-overs to the dogs," Elizabeth explains. "We needed to avoid the temptation of getting Fran's birthday cake out of the car or digging into our emergency rations that some of us had in our rucksacks." 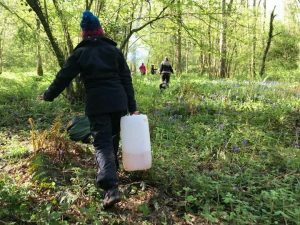 Woodlands.co.uk supports a number of initiatives encouraging women to get involved in woodlands, and this group used one of its woodlands near Chepstow which is mostly managed for conservation and timber production. The project was set up by Bex Band of the project Love Her Wild. Woodlands.co.uk is also working with Bec from HoneyWoods Camping who was one of this "band of ten" in offering support for vulnerable women and those recovering from issues like drug addiction and social isolation, and runs projects including The Hawthorn Project for women in recovery, www.thehawthornproject.org. An amazing and inspiring read. 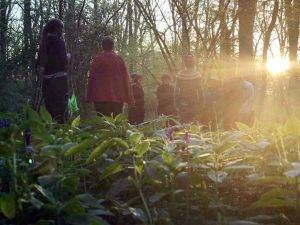 Men Only – Are we excluding women from UK woodlands?